I am trying something new. Have you heard of intermittent fasting? How about putting butter in your coffee? 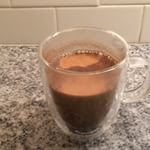 I am getting up at 6 am and making an organic cup of french roast coffee in my french press pot and adding a TBS of my delicious ghee. I made ghee from the unsalted Kerry Gold Irish butter the last time. SO CREAMY AND DELICIOUS! I enjoy the coffee and walk George the dog a mile. I am getting some exercise without eating. After taking Thomas to his program at 9 am, I come home and have breakfast. I haven’t eaten for 14 hours. It is a completely different thought process of having breakfast first thing in the morning. I know many wait until later but for now I am hungry at 9 and I feel like I better eat something! This was my breakfast this morning. 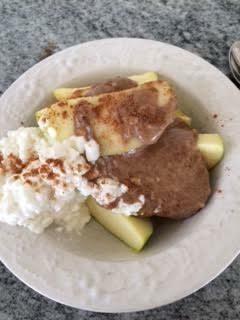 An organic granny smith apple, organic cottage cheese , almond butter and sprinkled with cinnamon. A three minute video. What do you think? Have you tried this? It is a process.